Allegiant was a Prospect Horse in June 2009. 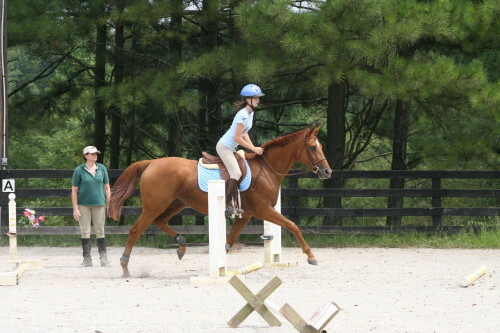 She and Amanda are coming to Bits & Bytes Farm for jumping lessons with Elizabeth. The lesson was AWESOME!! Alle and I had a TON of fun. Allegiant really enjoys learning how to jump, as do I. We are hoping to be able to trailer her to your place once a month for a lesson (hopefully she’ll get better about trailering as we do it more ). I went into the trailer and hooked her lead line on, and she unloaded perfectly! I let her walk around for five minutes, then I put her in the stall so she could drink some water and have her food. The pictures are awesome!! If you have anymore, let me know. See all of Allegiant’s Photo Galleries.